CWs commitment to providing the best industrial tub grinders carries through to the mid-sized WC series. We understand that grinding operations suited for a mid-sized grinder need the same performance & reliability that larger operations require. We went to extra effort to make sure that even though the WC series is less expensive than our larger models, they are still worthy of being called HogZilla Monster Tub Grinders. Instead of following the same course as other manufacturers who started small and adapted small grinder features into a larger grinder, CW started into wood grinding completely focused on providing the biggest and highest production machines. This has allowed CW to adapt its proven, big grinder features into a smaller, mid-sized model. We are convinced that our passion for providing the biggest and the best is one of the reasons that we have been able to design such a tough and productive mid-sized machine. 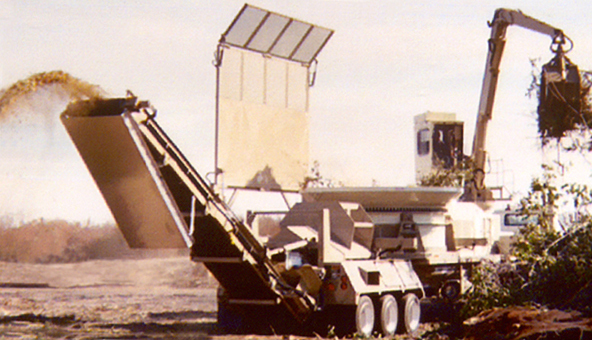 WC grinders come in three standard models including self-loading and self-propelled track drive machines. The WC series is standardly equipped with a Hydraulic PTO drive. This hydraulic clutch is similar to those found in high horsepower power-shift transmissions. Mid-sized grinder owners are no longer forced to use the dry over-center clutches. WC grinders are often equipped with an upgrade Torque Converter or Hydraulic Coupling drive based on the customers request. Reference the information regarding the TC and HC series machines for more information on Torque Converter and Hydraulic Coupling drives. Similarities can easily be seen between the WC series and the HC series HogZilla. Offered in horsepower ranges that overlap, it was necessary to maintain many of the same features. CW knows the requirements placed on all sizes of grinding operations, and there is a firm belief that certain features must be standard on every HogZilla. We are committed to this even though other manufactures may market a stripped-down, base model grinder.